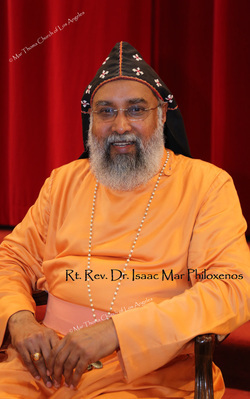 Mar Philoxenos was born on 1951, December 5 as the third son of A M Issac and Mariamma at Attupurathu House, Mavelikkara, Kerala, He had his schooling at B.H. High School and college education at the Bishop Moore College, Mavelikkara. He received his Masters degree in the Princeton Theological Seminary, New Jersey and Ph. D. from The Banaras Hindu University on the subject “The Doctrine of Grace in Vaisnavisim and Christianity”. He was ordained as the priest of the Mar Thoma Church in 1976 and consecrated as the Bishop of the Mar Thoma Church in 1993, while was a faculty of the Mar Thoma Theological Seminary, Kottayam. He was in charge of the Kottayam- Kochi diocese from 2001 to 2008. He promoted the development in the high range area and emphasized the work against the social evils. He served as the chairman of the Kerala Council of Churches, Thomas mar Athanasius Memorial Research and orientation Centre and Thomas Mar Athanasius Institute of Counselling. Mar Thoma Guidance Centre and Munnar Retreat Home was built during his tenure. He led the Chennai- Bangalore Diocese from 2009 to 2016. Thirumeni was keen in devising and implementing various plans to transform the Diocese into model diocese of mission. He initiated the development of the new Hospital and Guidance Home at Vellore and in acquiring land for mission work in Chennai, Sivanmpet (Sangareddy), Karaikal (Puducherry) and Bangalore. His ecumenical leadership was so profound dynamic that he was elected as a member of the central committee of the World Council of Churches, the President of the Senate of Serampore College and Chairperson of Ecumenical Christian Centre, Bangalore.